Zip Codes: 10012, 10013, 10014. This picturesque cobblestone lined neighborhood is known for its cast-iron buildings and designer boutiques all bound within one of the city's most hip and desirable districts. Although mosted zoned for residential use the neigborhood boasts some of the finest Loft Buildings in Manhattan. The area's lack of empty lots in additional with many landmark status properties has made new construction sparce. Today, any residential real estate projects that get underway are of the luxury variety. Soho has something to offer everyone from a high-brow nightlife scene to outdoor restaurants, Soho has plenty of amenties to offer for residents and office tenants alike! 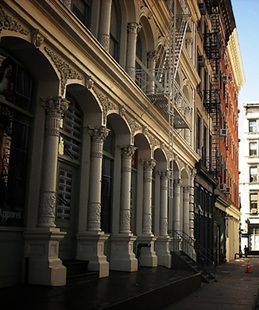 The cast-iron construction found within Soho is the largest example in the world to date. Many properties along Broadway and on Spring Street feature this type of architecture. Small Commercial Brownstone Condo Off Mercer 1,500 SF. / $59 per SF. 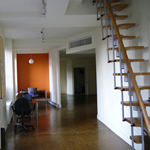 Blank-slate 1,500 square-foot loft office is situated on one half of a turn-of-the-century townhouse perfect for a start-up, small firm or “break-out” group of professional individuals. What tenants lack in a more traditional office space, they make up for in a homey workspace and an amenable landlord ready to rework/rewire the office per most specifications. Options include individual offices, cubicle spaces or an industrial SoHo-style open-floor layout. The surrounding neighborhood abounds sleek boutiques, hip lounges and a even an trendy, but historic, dive bar. 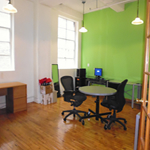 Spring Street Office for Lease 1,500 SF. / $57 per SF. This well priced loft space offers abundant natural light which is accented by the gleaming wood floors throughout. The commercial space currently enjoys a flexible wide open area, towards the rear of the space you will find a wet pantry and storage closet. This office is kept cool via its own tenant controlled central A/C. The building property itself is centrally located in Soho and features 24/7 access with an attended lobby from 8am to 6pm Mon to Fri. 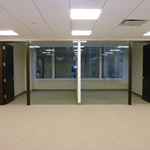 In addition the building has renovated its halls thus offering modern common areas which have been brought up-to-date, futhermore the building contains a very large freight elevator which is met by load bearing floors. Greene Street Office for Lease 1,800 SF. / $60 SF. 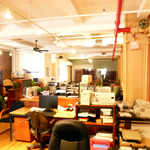 The following listing is for a commercial sublet space in Soho on Greene Street within creative design firm; the space offers a quiet contemporary atmosphere all bound in a SOHO Landmark Building. Standard loft installation, polished hard wood floors, high exposed ceilings, on the top floor of a 5-story commercial property - which offers abundant natural light throughout the day. Furthermore, the office is serviced by a shared Pantry with seating. At request the sublet may offer furniture (which is an option today but may not be so tomorrow). 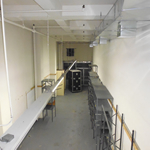 This sublet space is in move-in condition ready to accomodate you and your staff! Broom Street Office for Lease 1,850 SF. / $60 SF. 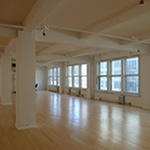 Prime Soho commercial loft in a beautiful landmarked loft building offering a full floor presence. 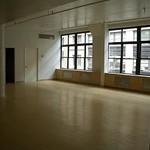 The space enjoys all the standard loft-like details(high ceiling, wood floors) with windows facing both North & South. The space is currently configured with a mix of private perimeter offices and a general open workspace for staff, the floor is serviced by two private restrooms, and a Pantry with enough room for either extra storage or seating. The building has in the last two years had its elevator cabs renovated for an increased professional standard expected in a professional property. The loft benefits from a flexible lease term from 3 to 10 years creating added value for either the short or long term tenant. 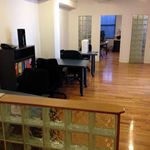 Grand Street Office for Lease 1,900 SF. / $52 SF. Beautiful loft-style Soho corner full-flooroffice/showroom in one of Soho's best buildings with tons of natural light from plenty of windows. 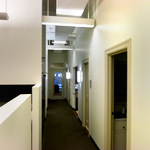 The office currently configured with 2 perimeter private offices, large open workspace, pantry, and private restroom. This spacious renaissance revival cast-iron property is a former warehouse filled with old world charm, featuring exposed brick, beautiful hardwood floors, and high beamed exposed ceilings - perfect space for creative, architectural, engineering, fashion, design and marketing firms. The building offers 24/7 access and features a newly renovated lobby and modernized entrance all within a convient Soho location. 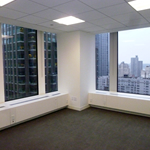 Broadway Office Sublet for Rent 2,050 SF. / $54 SF. 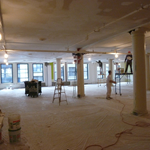 A commercial sublet office through a computer support company is now available in a historic landmark building in the heart of SOHO. The space comes fully furnished (You can use the existing desk & chairs, or replace them with your own) with desks, chairs, and x4 workstations, T1 internet access plus all utilities included. Additional computer services and phones are available at favorable rates. Excellent location, fully carpeted, large window, sunlit space. The sublet is within a classic loft environment that offers high ceilings and an open plan - all of which is benefitted by shared kitchenette, bathrooms, and conference room.This subleased space stands in a full service commercial building w/ an attended lobby on Broadway overlooking the thoroughfare with great views in both directions. 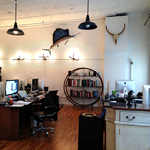 Small Loft Above Prince Street Shops Perfect for a Start-up Label 3,000 SF. / $56 SF. This Class-B, 3rd-Floor, 3,000-square foot space offers few extra frills aside from part-time security and building maintenance, but well-lighted, open areas provide plenty of room for inspiration. With an open, loft-style layout, the right tenant has the room to design creative, custom-made cubicles with drafting tables, collaborative workspaces with wiring for state-of-the-art sewing machines and experimental runways to prep for the tightest of Fashion-Week schedules. All the major label – and avant-garde – clothing stores line the downstairs streets for a quick stitching or sizing reference or a pattern to be toppled! Elizabeth Street Office for Lease 3,000 SF. / $49 SF. 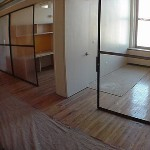 Made-to-Order and Rarely Available Sublet in Tech-Hub of Manhattan – This top-floor 3,100 square-foot sublet in the heart of SoHo fits the growing needs of any new media/tech company. With fantastic natural light, high-end finishes and 18’ windows, employees have the option of looking at gorgeous sky or down on the SoHo foot traffic. The management company of this Class-B space will work with most office layouts in terms of open, cubicle or bullpen, and a conference room with sliding glass doors, a wet pantry next door, two restrooms and a shower offer amenities for late-night website planning sessions. Wooster Street Office for Lease 4,000 SF. / $62 SF. 21st Century Office Outfit in Eco-Friendly Wooster Street Loft – Premiere Manhattan management company is looking for an upstart law firm, think talk or advocacy organization to take over this 5th floor-to-ceiling windowed 4,000-square-foot, open loft space. Though it features all the basics of a 21st-century SoHo office – advanced CISCO video conferencing cubicles, bullpen-suites, high-speed WiFi and a stainless-steel kitchen – the selling point of the building is its eco-friendliness. In the same vein as other downtown buildings, the management has installed advanced piping to reduce waste-water flow, partitions made of recycled material and energy efficient electrical. A part-time doorman and high-tech alarm system keeps all amenities in place and proper working order. Elizabeth Street Office for Lease 4,000 SF. / $54 SF. On Cobblestone Streets, Lower-Floor Space Offers High-Level Art Access – Though Class B property with fewer amenities than the surrounding new construction (think daytime doorman and a nondescript lobby), this 4,000-square-foot office space in a cast-iron building nonetheless provides unfettered artistic connections steps from its front door. Immediately adjoining a stretch of New York’s most famous galleries, user-friendly management will configure this floor for any importer or luxury goods management outfit, including international art auctioneers. Amenities include CISCO conferencing, high-speed broadband Internet connectivity and XBLUE phone systems. Accessible freight elevator grants easy access for palettes of antiques, paintings and furniture. Greene Street Office for Lease 7,000 SF. / $63 SF. 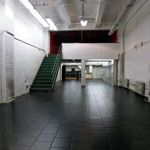 Top-Floor 7,000 SF Loft Waiting for a Creative Touch – Though located in a Class-B building recently purchased and undergoing renovation, this 7,000-square foot space offers plenty of room for inspiration and ingenuity. 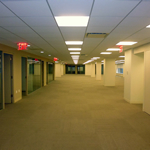 User friendly management will configure this floor to any specification, though ideally suited for New York bureaus of news agencies, global think-tanks or headquarters of a small(ish) international nongovernmental organization. Accessible freight elevator grants employees freedom to transport and install all the necessary equipment for advanced telecoms and collaborative workspaces. Nearby hotels and lounges on nearby Grand Ave. and along Thompson Street help employees from other countries transition easily to cosmopolitan Manhattan! Lafayette Street Office for Lease 8,200 SF. / $55 SF. This spectacular space is located in the charming Soho district and offers about 8200 sq/f divided on two duplex floors. The primary level and front of this space has 40 linear feet of windows from floor to ceiling all bound in a space with 13 1/2 foot ceilings highlighted by the original gorgeous wood floors that have been kept intact to combine and blend together with the beautiful façade of this prewar cast-iron property. The secondary level of the duplex office contains a mix of private offices and a central pre-built open working area with 40 cubicles, x2 conference rooms, a copy room / mail center, small pantry, an IT closet (with wired Rack to ports throughout office) numerous storage closets and a freight elevator which opens up directly yot the mail center. For further details Call us Direct - so we can set up a tour ASAP. West Broadway Office for Lease 8,575 SF. / $64 SF. Spring Street Office for Lease 8,700 SF. / $65 SF. This outstanding office currently stands in a clean condition which was renovated to a high-standard four years ago. The commercial space herein offers ample desk space which can accomodate 120 (HUGE open space, approx 2700 sq feet in the Main Room alone), an equisite well lit corner CEO private office with windows and private restroom, a lounge-style kitchen/pantry, glass enclosed stone floor entry (landing directly off the elevators), adjustable halogen lights with faders throughout, two Conference Rooms (one w/ a digital projector and mini stage with curtain), and freight elevator access. The property bears 4 high-speed elevators and a freight elevator that opens to the sidewalk at street-level. 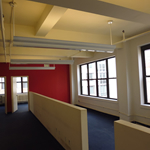 If you are an entrepreneur and have ever dreamed of a beautiful, large, finished 8,700 SF SoHo office for $55/square foot, pinch yourself now. All serious offers to lease the space will be considered. West Broadway High-Rise with Spectacular Views of Uptown – Built to draw some of the biggest-name prestigious corporations and incubator firms, this 9,000-square-foot office in a Class-B building is ready for instant occupation. A large renovated reception area provides a gateway to newly redone offices and cubicles featuring beautiful hardwood floors, freshly painted walls and an embankment of large windows with a view of Uptown Manhattan via Lafayette Street. Brooklyn straphangers are close to the 2nd-Avenue F, which stops at both Penn Station and near Grand Central. As the seasons change, so do the landscapes of nearby SoHo Square, Vesuvio Playground and Mercer Street Playground, which features paths for in-line and roller skating, running and bicycling – all readily accessible during lunch breaks! 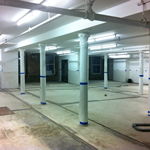 Mercer Street Commercial Loft for Lease 9,500 SF. / $56 SF. Split-Level Office Steps from Houston Perfect for Start-Up Magazine or Website – Situated just below Houston in the Cast-Iron district, this split-level office features 4,000 square feel of bullpen space and conference rooms overlooking a 5,500 square foot newsroom and a production arena. Large windows with good sunlight to the North and East keep the creative vibe going and a kitchen with ample space for snacks and coffee offers fuel for late-night closings. A stone’s throw from some of the brightest new media companies, this must-see space comes with a negotiable price, close proximity to most of Manhattan’s subway lines and a nightlife scene suited for all media types! Spring Street Office for Lease 10,000 SF. / $59 SF. Upper-Level, 10,000 SF Space in Landmarked Turn-of-the-Century Building – Perfect for an up-and-up real estate brokerage, accounting business or law firm, this 10,000-square foot, 12th-floor office in a Class-B building stands in the heart of the SoHo Cast-Iron District. Built in the later stages of the 1840s-1880s era, when architects specifically designed structures around the intricate iron patterns, this building is landmarked, but that doesn’t make it outdated. Circled by natural light on all sides, the office features modern made-to order office cubicles and a newly renovated kitchen and bathrooms. All the old-school, refinished SoHo bars along Crosby street still satisfy any client’s or visitor’s need for a taste of classic New York! Broadway Office for Lease 15,000 SF. / $62 SF. SoHo Ground Level Office and Marketing Space in Cast-Iron District – Steps away from the artists’ habitat of the Lower East Side, this 15,000-square-foot space features a 2nd-floor-office above a large showroom perfect for displaying the next Basquiat or Schnabel. With 18’ ceilings and a large backroom with slats and other provisions for storage, possibilities abound, including red-carpet shows and celebrity-laced receptions. For the right lessee, management will renovate the showroom and reconfigure the storage to the closest of specifications, including custom racks, long walkways and refinished floors. DIY wine shops, bakeries and high-end catering companies line the streets to help with the grandest of openings! Neigborhood Details Noteworthy Properties: The E. V. Haughwout Building - 488 Broadway, The Little Singer Building - 561 Broadway, 110 Greene Street (The SOHO Building), 109 Prince Street, 112 Prince Street, 295-309 Lafayette Street (The Puck Building), 568-578 Broadway (Prince Building), 40-42 Thompson Street (Manhattan Brewery Buillding), 418-420 Broadway (The Oltarsh Building), 128-138 Mott Street (Metz Building), 599 Broadway (Soho International Arts Center), 495 Broadway (The New Era Building), 375 West Broadway. Corporations Headquarters in the Area: Apostle, Axiom Law, Bath & Bodyworks, Bliss Spa, BluePrint, Coach USA, Code and Theory, Coldwater Creek, Creative Media Marketing Inc, Elton John Aids Foudation, Estee Lauder Inc., Exis Capital Management, foursquare, Frédéric Fekkai, GoFish.com, Guilford Publications Inc., Marc Jacobs International LLC, Michael Moore Literary & Talent Agency, MODO, NACLA, Paradoxal Inc, Plough Penny, Polar Capital Group LLC, PostWorks NY / Orbit Digital, PQ New York Inc, Slover & Company, SteveMadden, Subvoyant, Swiss Institute, TAG Worldwide USA Inc., The French Culinary Institute Inc., The Leadership Program Inc., The Princeton Review Inc., TheHuffingtonPost.com Inc., Wooster Group Inc The, XL Video, ZocDoc. Nearby Landmarks: Brooke Alexander (59 Wooster St.), Children's Museum of the Arts (103 Charlton St.), The Culture Project (49 Bleecker St.), Dactyl Foundation for the Arts & Humanities (64 Grand St.), The Drawing Center (35 Wooster St.), Goethe-Institut New York (72 Spring St., 11th fl. ), The Gunther Building (469 Broome St.), Harris Lieberman (89 Vandam St.), The Haughwout Building (490 Broadway), HERE Arts Center (145 Sixth Ave.), Janet Borden (560 Broadway 6th fl. ), Joyce SoHo (155 Mercer St.), New York City Fire Museum (278 Spring St.), Ohio Theater (66 Wooster St.), Peter Freeman Inc. (560 Broadway Ste. 602), Rock and Roll Hall of Fame Annex (76 Mercer St.), Ronald Feldman Fine Arts (31 Mercer St.), SoHo Playhouse (15 Vandam St.), Staley-Wise Gallery (560 Broadway 3rd fl. ), Swiss Institute of Contemporary Art (495 Broadway, 3rd fl. ), and the Team Gallery (83 Grand St.). Hotels in the Area: Crosby Street Hotel, The James New York, Four Points by Sheraton Manhattan SoHo Village, Soho Grand Hotel, The Mercer Hotel, 60 Thompson - A Thompson Hotel, Holiday Inn SoHo New York, Hotel Azure, and The Soho Loft .